Our third adventure of the summer took us to the little town of Pentwater. As a teenager my family used to camp there during the summer. I have fantastic memories of hanging out at the beach, walking through town to get ice cream, jumping off of the pier, swimming with friends at night, meeting all of the "townie" boys, and just having good old fashioned summer fun! Ryan's family also used to camp in Pentwater when the kids were younger. When Ryan and I first were married they began renting a cottage behind the campground. They invited the entire family which meant their two boys, two girls, spouses, and all the grandchildren to come up and hang out. I think they rented the cottage until Jackson was about two. After that, Ryan's parents brought the grandkids up for a special day to play on the beach, go up Old Baldy, and eat blue moon ice cream each summer. The other night Ryan and I went to a Tesla/ Mötley Crüe concert. The music was loud, the lights were bright, the crowd was crazy, and the atmosphere was pure adrenaline! There is nothing like a concert to get you moving and make you feel like you are younger then what you are. Which in turn makes me think how young is too young to go to a concert? Warning: This post touches on the "birds and the bees"
Recently he found a tampon that hadn't gotten flushed floating in the toilet. He was of course concerned about why there was blood in the toilet and what that thing really was that he had used as a cannon with his army men a few years back. 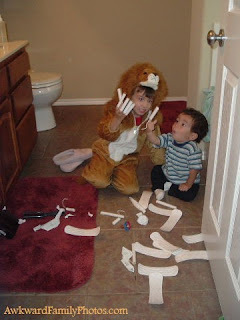 His Dad explained that it was a tampon. He also explained about a uterus and how it had (and I am using his Dad's terms here) "a mineral rich lining to feed a developing baby. When there was no baby, the body shed the lining. In order for there not to be a huge mess women use pads -you've seen those in Mom's bathroom right? and tampons to catch the blood." The only big outside adventure that we all did was to go swim with dolphins!